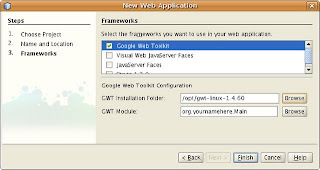 On the Google Web Toolkit blog, Jeet Kaul, VP of Sun's Developer Products and Programs talks about using NetBeans to build web apps with GWT. GWT Support Plugin for NetBeans project homepage. A screencast to learn more about GWT support in NetBeans. A good course for GWT and NetBeans.